Many homeowners turn to pressure washing when they want to clean their fences, but the aggressive force of such a powerful wash can actually damage the wood. That’s why Renew Crew of Springfield uses a unique process that’s both gentle and effective, perfected over our 20 years of fence cleaning experience. First, we apply our special non-abrasive foam to your fence. It deeply penetrates into the fibers, lifting out ingrained dirt without damaging the wood. Unlike other fence cleaning foams, our formula contains no chlorine, so you don’t have to worry about breakdown or bleaching caused by harsh chemicals. Next, we rinse your fence clean with a gentle power wash. We know just the right amount of force to use to eliminate the grime while keeping the wood strong and intact. Finally, we coat your fence in a sealant that protects it from nature’s wrath. In addition to keeping out moisture, our sealant blocks the sun’s UV rays, preventing discoloration and degradation. It also helps prohibit the re-growth of mold and mildew so that your fence can go longer between cleanings. 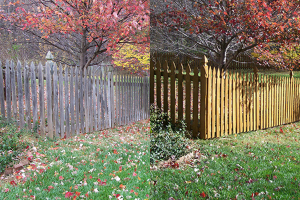 Is your fence looking a little worse for wear? Don’t reach for that pressure washer. Instead, count on the experts at Renew Crew of Springfield to restore your fence to its former glory while protecting and preserving it for the years to come. Contact Renew Crew of Springfield at 417-865-9663. We’d be happy to answer any questions you may have about our services.